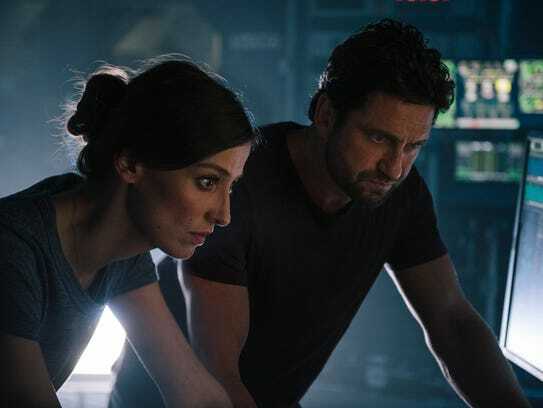 A series of natural disasters caused by a malfunctioning climate-control satellite system threaten the entire globe in the sci-fi action film ‘Geostorm.’ Warner Bros.
Let’s be honest: You don’t go into something like “Geostorm” thinking it’s going to be great. But there are things you expect to see, and actually hope for. For instance, Gerard Butler swaggering around for a couple of hours as a wisecracking action hero? Sign me up. 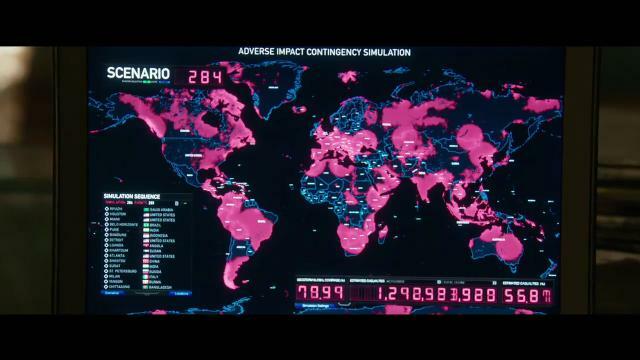 Whiz-bang visual effects depicting the destruction of major cities around the globe? Neat-o! But when the movie can’t even fulfill those relatively meager pleasures, you’re left with a big, boring mess like “Geostorm.” It’s an action movie without an exciting moment. It’s a special effects flick with chintzy visuals. And it’s a Gerard Butler vehicle without enough Gerard to go around. The actor plays Jake Lawson, a boozy scientist who designed Dutch Boy, a web of satellites that puts an end to extreme weather conditions by… linking something to something that makes it do the opposite of something else… maybe. The movie explains its science in a talky, dry way that makes you immediately check out. Dutch Boy malfunctions, creating global weather catastrophes instead of preventing them. But maybe it isn’t a malfunction; could it be… sabotage? That’s where Jake should kick into action, smashing heads and tossing off catchphrases: “Weatherman predicts some rain!” would have been a particularly saucy one. Wrong — instead Jake is blasted off into space to work on Dutch Boy. Most of the action seems to focus on Jake’s charmless little brother, Max (Jim Sturgess), who replaced Jake as head of Dutch Boy three years earlier — awkward! So the blah Max stays here on earth, working on the mystery, wooing the girl (Abbie Cornish, equally dullsville) and evading the bad guys. Jake, meanwhile, is in space, working with his multinational crew — Mexican megastar Eugenio Derbez pops up to say, oh, eight lines — and determining if there is a ringer in the mix. With a good script, Butler is a strong actor; give him weaker material, and he compensates with his charismatic, engaging presence. But he’s strangely neutered here, with none of the jokey edge he normally brings. Boy, this movie could use some of that. Along the way, tidal waves hit, buildings fall like dominoes and temperatures drop so low that people freeze to death mid-movement. But the effects never emotionally grab a viewer, and there is never a “wow” moment. It’s like watching something a college student came up with for a CGI course. You appreciate the effort, but that’s about it. Dean Devlin produced, co-wrote the script (he co-wrote “Independence Day”) and makes his directorial debut here. For an industry veteran, he seems to have no clue how to create a film. “Geostorm” is flat and static, without any sense of drama or excitement peeking through. There are weird choices throughout: Sibling-rivalry drama? Seriously? It is also badly lit, poorly edited and full of dialogue that is either stiff or stilted: “United we stand, united we can!” exclaims the president (Andy Garcia). In another moment, a character uses the term “RocknRolla,” which makes you think of “RocknRolla,” a movie that reminds you how much fun Gerard Butler can be, and how much fun he’s not having here. Neither is the audience, by the way. Cast: Gerard Butler, Jim Sturgess, Eugenio Derbez, Andy Garcia, Abbie Cornish. Rating: PG-13 for destruction, action and violence.